The literary translation of Kristallnacht is ‘Night of Crystal’. It is also known as ‘Night of Broken Glass’. It was an incident that took place on November 9 and 10 in the year 1938. It was a part of the anti-Jew mission of Nazis. It was a day of the organized destruction of Businesses and homes of Jewish people. This incident got this name because this attack resulted in covering the streets with the shattered glass from the destroyed homes and shops. Approximately 91 Jews were murdered and 30,000 were arrested and sent to concentration camps during Kristallnacht. More than 250 synagogues were burned and 7,500 Jewish businesses were destructed. Two of the largest Jewish communities were in Berlin and Vienna. These communities were the biggest targets of stacks by SA mobs. Kristallnacht initiated the violent methods of German and Nazi harassment of the Jewish people. To make it more insulting, the Jews who survived this pogrom were forced to pay for the damage inflicted upon them. At that time, Germany did not produce plate glass. Belgium’s total plate glass production took 6 months to replace all the broken glass windows. Germans were looking for a way to get rid of Jewish people living in Germany. The German police arrested 17,000 Polish Jews and sent them back. Poland did not want them either. These people were put in a ‘relocation camp’. Zindel Grynszpan, Polish Jew was one of them. 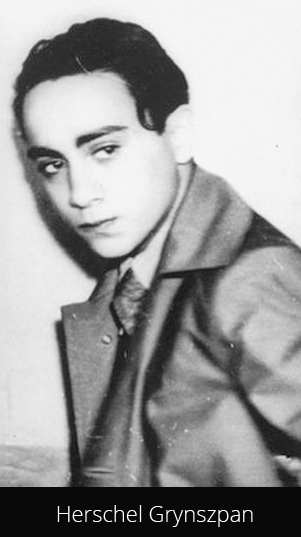 His 17 years old son, Herschel Grynszpan was very much concerned about his parents. He got hold of a gun and walked into the German Embassy. He shot the Third Secretary, Ernst vom Rath who died two days later. Joseph Goebbels, the German Chief of Propaganda announced a program to punish the Jews in response to the assassination of Rath. This punishment program was Kristallnacht. Declan, Tobin. " Kristallnacht Facts - Kids History ." Easy Science for Kids, Apr 2019. Web. 20 Apr 2019. < https://easyscienceforkids.com/kristallnacht-facts/ >.